Attached photo (taken by a passing hiker, name unknown): Taken 6/25/16 during climb of the backside of Flat Top near Anchorage. Pictured L to R: Forest Wagner, Andy Sterns, Forest’s father Joe Wagner. On April 18, University of Alaska Southeast (UAS) Assistant Professor Forest Wagner, 35, was mauled by a brown bear while leading a six-day mountaineering course. The incident occurred on the northeast aspect of Mt. Emmerich near Haines, Alaska. Wagner was on skis and apparently surprised the bear, which charged and attacked him. In retrospect, Wagner suspects the bear was not hibernating due to an unusually warm spring, and that his ski track likely landed too close to the bear’s den. A bear cub was seen nearby. The sow was undoubtedly being protective of her cub. Bear biologists have found that many bears across coastal Alaska did not fully hibernate during the past winter. Typically they hibernate into May. 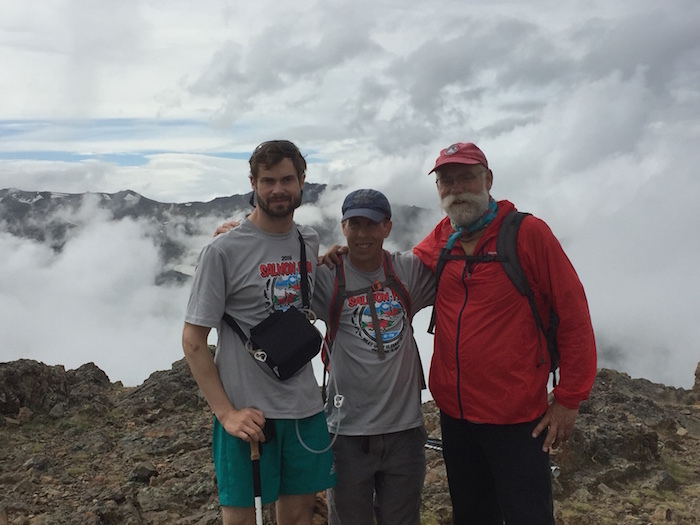 After ten surgeries and ongoing physical rehabilitation, Wagner is now walking around and has even climbed peaks on the weekends in Anchorage where he is residing as an outpatient. A major injury on his left side will require a skin graft. Medical professionals have indicated that he is healing well and expect him to have a full recovery. Wagner expects to return to Juneau in August in time for the start of the new academic year at UAS.